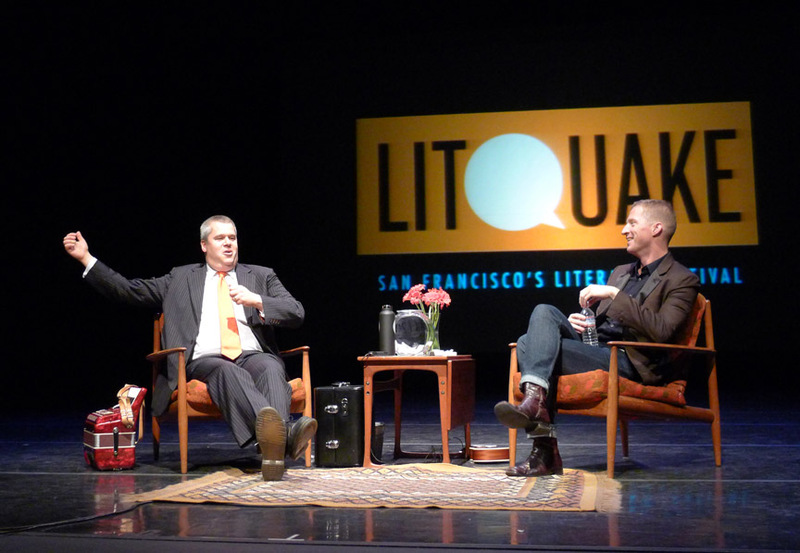 Daniel Handler (author of The Basic Eight, Watch Your Mouth, Adverbs, as well as the Lemony Snicket books) and Andrew Sean Greer (author of The Story of Marriage, The Path of Minor Planets, and The Confessions of Max Tivoli) have great chemistry. You know how I wished that events billed as, “conversations between authors,” would make me feel like I was hanging out in a living room with two awesome, smart people? That happened tonight! First of all, congrats to Z Space in San Francisco for creating a warm and inviting stage “set.” Comfy chairs, a nice rug, flowers on the table–the mood was right from the start. The message here was, if you are struggling with a passage, perhaps it isn’t any good and you can just throw it out. I like that! Andrew muses about that strange feeling that if something is easy to do, it must be no good. Doing good work is supposed to be difficult. Strange how so many of us have had that idea pounded into us. They covered recipes for starving artists (minestrone with a stolen parmesan rind? ), how to throw a cheap cocktail party (trick your guests into bringing the booze), what kind of servant you’d like to have, which book you’d like your life to be like, how to name characters (pretend you need a name for a friend’s baby), music to write by, how to cause a riot, and more. I feel very well informed after this lecture! 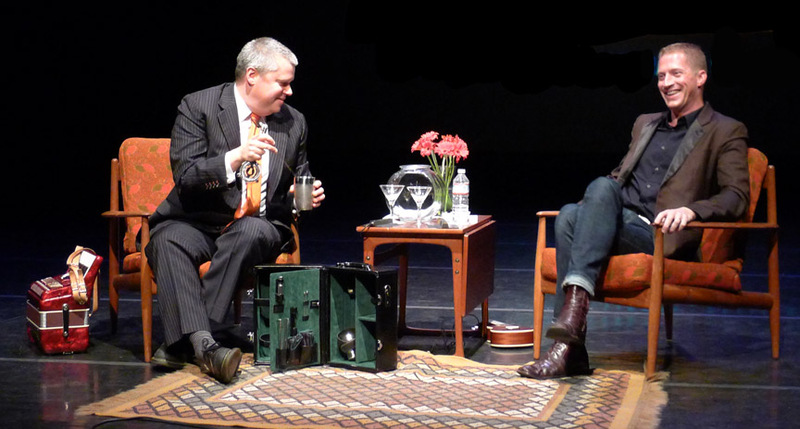 After a sparse spattering of questions from the audience (I often draw a blank at these times) Daniel Handler brought out a fabulous vintage cocktail kit, (I’m not sure what you call these things. A cocktail suitcase? Portable bar? )–and proceeded to make a martini for he and Andrew. They’d only taken a few sips before they launched into a maudlin accordion/ukelele duet. An evening to satisfy all the senses. 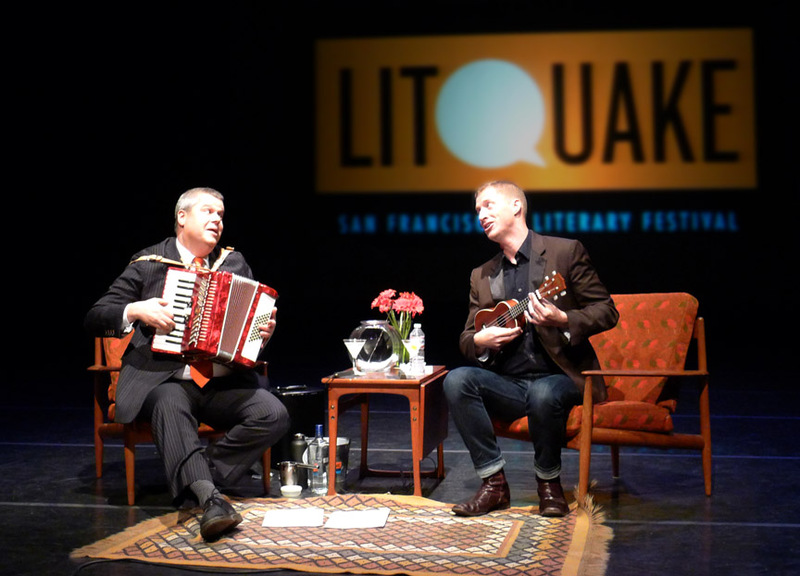 Thanks, Litquake, for making this happen! You obviously got a better seat than I did—your photos are great! And you captured the event really well. (Did you take notes? How did you remember so much?) Can I have your permission to use the photo of them singing to illustrate my blog? Of course I would give you photo credit. I was so excited about embedding the video I took of them singing, but apparently I only got the applause at the end…so now I don’t have an image at all. I can check back here or you can link to my blog and leave a reply there. tanyagrove.wordpress.com.